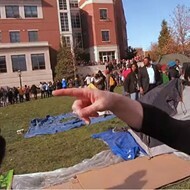 University of Missouri Assistant Professor Melissa Click has been fired. As it turns out, Melissa Click is the one who needs to get out. University of Missouri’s leadership has voted to fire the assistant communications professor who famously called for “some muscle” to force a student journalist away from campus protests. 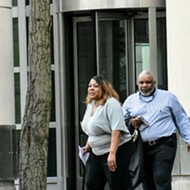 The university’s Board of Curators on Wednesday night voted 4-2 in executive session to fire Click for the showdown with Schierbecker, as well as a previous clash at Homecoming, in which she was accused of interfering with police officers trying to keep protesters from blocking a parade. More than 100 Missouri legislators signed a letter calling for the university to fire Click, and a nearly equal number of university faculty members signed a letter in her defense. In recent weeks, Click has been on a charm offensive. A public relations firm working on her behalf showered reporters with smiling headshots of the controversial instructor and landed her an interview with the New York Times. The board apparently disagreed, ousting her after nearly a month of investigations and back-and-forth with Click. She can appeal the board’s decision.